The film crew of Evgeny Poddubny, our military correspondent in Syria, was able to find the people responsible for fabricating footage of the alleged chemical attack in Douma. The militants enticed hungry children with food and then used them for the provocative footage that they then distributed with the help of the White Helmets. Evgeny Poddubny's exclusive report shows unique proof that must be considered in the investigation. 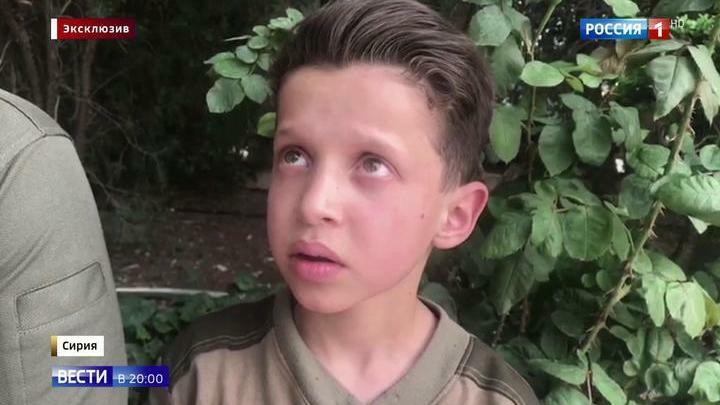 This 11-year-old Douma resident doesn't know yet that he'll probably be famous soon. This child is proof that the Western countries had attacked a sovereign state using falsified information from radical Islamists as a pretext. This footage, which was shot on April 7th, shows Hassan Diab receiving first aid, or appearing to receive first aid, in a hospital in Douma after an alleged chemical attack. As they pour water on him and shake him, Hassan, who is soaking wet and frightened, doesn't know what's going on. He was home by that evening. Now, it's clear that there's no reason to worry about him. This is what the boy told our channel in an exclusive interview. Hassan Diab, a participant of fabricated footage in Douma on April 7th: "We were in the basement, there was nothing to eat. Mom said we'd eat tomorrow. We heard someone yelling outside, 'Go to the hospital!' We ran there, and as soon as I went in, they grabbed me and started pouring water on me. Then, they put us on beds next to other people". We showed Hassan the video that the media all over the world had been showing. He quickly recognized himself. The boy's father, Omar says the militants didn't explain anything to the child, they just yelled outside. They urged everyone to go to 'the spot' — that's what they called the hospital in Douma. Omar Diab, Hassan Diab's father: "When I found out my kid was in the hospital, I left work and ran there. There was no chemical attack. I was smoking outside, I didn't feel anything. I entered the hospital and saw my family. For participating in the filmmaking, they gave us dates, cookies, and rice, and let everyone go. My kid was just fine". Hassan is in good health, but he can't understand why he's getting all this attention. The boy is actually lucky to be alive. As we know, foreign special services often leave no witnesses during such operations. The militants left a lot of evidence in Douma. It looks like something went wrong there. The White Helmets activists filmed the aftermath of the chemical attack in this hospital ward in Douma. We now know that the footage was fabricated, even the hospital employees say so. Today, the hospital has the same staff as on the day of the staged video. This hospital staff member tells us how the events unraveled on April 7th. Baraa Badran, an employee at the Douma hospital: "We didn't admit anyone suffering from acute poisoning on April 7th. Sure, there were people who watered themselves down with a hose, but they had no symptoms. Several buildings were destroyed that day, some fires had started. Construction dust and smoke made it hard for many people to breathe. They were brought here, we helped them. Suddenly, someone ran inside and started yelling, 'Chemical attack! Chemical attack!' So, people started pouring water on themselves, but they had no signs of a chemical attack". Here's another puzzle piece that lets us see the whole picture. This is the radicals' underground lab. It looks like the militants used this lab to prepare their chemical attack provocation in Douma. Chlorine was produced here, technical documentation and chemical reagents were also found here. The militants could've been manufacturing poisonous chemical substances for their own military purposes. Over the past few years, experts in Syria have documented dozens of cases of chemical weapon use by the radicals. However, the West chooses not to notice these cases, and it's obvious why. Evgeny Poddubny, Aleksandr Pushin, and Stanislav Elovsky. Vesti from Douma, a Damascus suburb, Syria.